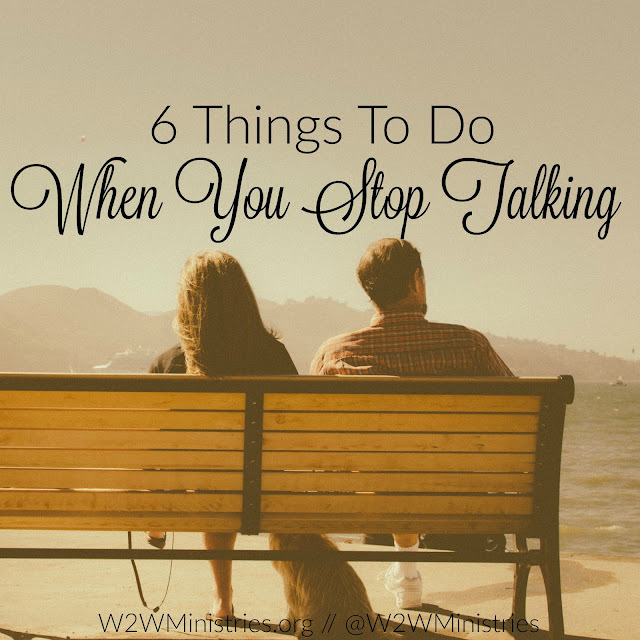 Has the communication in your marriage completely stopped? Maybe you're fighting, maybe you're not, but you're definitely not talking. I think many marriages go through seasons and one season might be a season of no communication at all. That's a hard place to be. It's a very lonely place to be. It creates tension in the home when you and the person you are married to and have committed to spending all of your living days with are not talking to each other. What can you do? How can you bring the communication back? The first and most important thing you can do is pray. There is no doubt that prayer is powerful and prayer works. Begin to pray and ask God to open the lines of communication between you and your husband. Don't pray for God to change your husband, just pray that there would be communication. Pray that God would help you to see any errors of your ways and help you to make them right. Pray that God would open your husband's heart to you. Pray that there would be love and laughter. Be first. One thing a lot of people do is wait for the other person to make that first move. Don't do that! Be the first one. You begin talking. Small talk is okay. When you have not been talking, don't jump right in with a deep conversation. It's okay to start small. Ask your husband about his work or his hobby. Ask him about something he loves. If you genuinely seem interested, he will start talking about his passions. Once he starts talking, listen closely. Don't get distracted by your phone, the tv or kids, give him eye contact and acknowledge things he said. If he doesn't reciprocate by asking about your work or hobbies, it's okay. Remember, you are starting small. Treat him like a man. One reason many couples stop talking is because one of the parties feels like they are being treated poorly, they even feel like they are being treated like a child. If your husband shares something with you, don't make fun of him. Don't put down his thoughts. Don't stifle his dreams. Let him share openly while you listen and show respect. Laugh with him. Not all conversation has to be serious. Laugh with him. Laugh at those cheesy jokes you've heard a thousand times. The more you and your husband laugh together, the easier the serious conversations will eventually become. Why? Because you are building your bond by laughing together. Communicate without using your voice. Communicate using body language; smile at him, wink at him, let your hand rub across his back as you walk by, little things like that communicate in a big way. Write him a letter tell him all the reasons you love him and slip it in his work lunch. Send him text messages that say I love you or I appreciate you. Do little things that will help ease his day; run a errand, do one of his household chores he hates, bring him a soda when he gets home from work, these things communicate I love you to him. Have you and your husband stopped talking? Try these 6 ways to open the lines of communication back up. Do you have additional ways to bring communication back? Share your thoughts and experiences in the comments. Hi Jenifer, great post. I have been checking out a lot of info about marriages lately and have come upon many great resources. This is just another great practical application of God's way of doing things, to encourage those of us in marriage!